A slew of recent provincial election results under the current Single Member Plurality voting system shows just how common it is for voters’ expressed intentions to be largely ignored in the makeup of the resulting legislature, and therefore how large swaths of the population end up not being represented the way they wish and deserve to be. PEI went to the polls in early October. The Liberals went into this election with a large lead – polls at the end of August were giving them a lead over the Conservatives of 59% to 31% (with the Greens and NDP splitting the last 10%) and, had this support held up, they certainly would have deserved to win a majority government. But would they have been entitled to win every last seat in the PEI legislature? That’s what seat projections were showing. Over the campaign, the race had tightened quite a bit: in the final days of the campaign, the Liberals lead had dropped to 53% and the Conservatives had risen to 34%. How would this shift in fortunes been rewarded by our voting system? The day before the election, the well-respected political predictor, Eric Grenier, at threehundredeight.com used polling data to estimate that the Conservatives would win a single measly seat. When the vote was counted, the race was even closer than the polls were showing – the Liberals had dropped a further 2% to 51% and the Conservatives had gained a remarkable 7% to end at 40%. 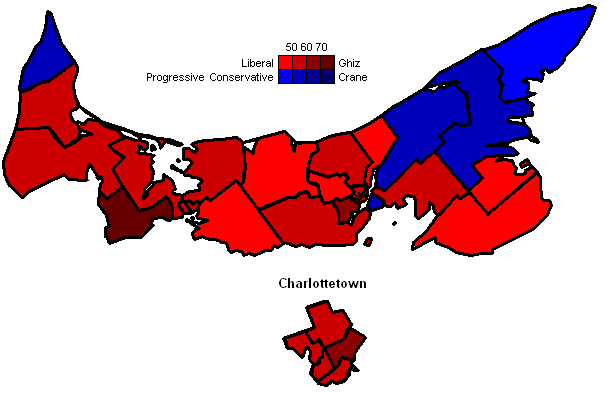 However, the Conservatives were not rewarded for their valiant campaigning, ending up with a mere 5 seats to the Liberals’ 22 – i.e., with 51% of the vote, the Liberals took 82% of the seats. Perhaps more importantly, the Conservatives were essentially shut out of the more urban parts of the province – only their Stratford-Kinlock seat is close to the capital. Such results are drearily typical of Single Member Plurality voting. Newfoundland had a similar outcome – the Conservatives won 56% of the vote and took a large surplus of seats: 37 of 48 (77% of the total). The Liberals retained the title of Official Opposition by winning 6 seats on 19% of the vote, while the NDP came in third with 5 seats on only 25% of the vote – well behind the Liberals. Huh? Only in the wacky world of SMP voting is 25% less than 19%! In PEI and Newfoundland, SMP delivered an overwhelming landslide to the leading party. In both Manitoba and Ontario, the two leading parties had virtually the same level of popular support, but in both cases one party ended up with many more seats than their near-rival – on the order of 1.5-2X as many. Such distortions greatly exaggerate the actual closeness of the race, and, as in PEI and Newfoundland, tend to produce highly regionalized results (see maps below). In Manitoba, the NDP won 46% of the vote to the Conservative’s 43% – quite a close contest. However, due to the vagaries of SMP, the NDP won 36 of 57 seats – 63% of the total. The Conservatives had to settle for 20 of the remaining seats, while the Liberals, who took 8% of the vote, had to settle for a single seat. 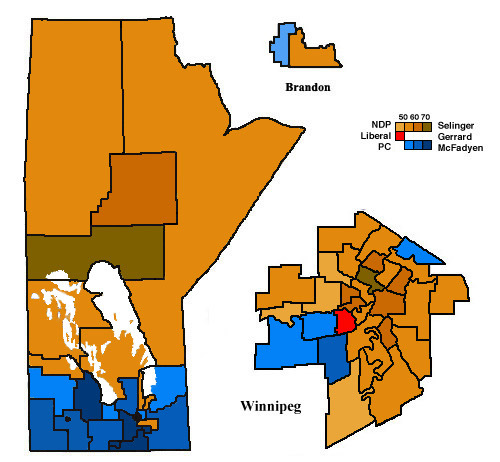 As with PEI, there was a strong regional (rural/urban) divide with the Conservatives winning virtually all rural seats in the south of the province and on the southwestern edge of Winnipeg, while the NDP won almost all the other seats in Winnipeg and the northern half of the province. It is somewhat ironic that the Conservatives had, at some points, been predicted to win a higher share of the popular vote than the NDP, but even if this had happened, the seat results would have remained unchanged. Conservative leader Hugh McFadyen resigned following the election, saying that the outcome was “far short of we had hoped for.” Despite virtually matching the NDP in the popular vote, McFadyen said “The reality is this in politics … you have to deliver bottom-line results if you want to carry on as leader of the party.” The irony is that this is not the reality in most countries around the world – maybe it’s time for the Manitoba Conservative Party to endorse a more proportional voting system so that their supporters can get the representation they deserve. The Ontario election in October produced a similar result – the day before the election, ThreeHundredEight.com was predicting that the popular vote was a solid three-way contest with the Liberals slightly ahead of the Conservatives (36.6% to 33.3%), but this small difference was expected to deliver twice as many seats to the Liberals than to the Conservatives. The NDP, with 2/3rds the popular support of the leading Liberals, were expected to win barely one third as many seats. In the end, the Liberals ended up at over 37%, the Conservatives about 2% lower at just over 35%, and the NDP down to under 23%; the Liberals won one seat shy of a majority at 53 seats and the Conservatives gained ground to win 37 seats (the NDP took 17). This seat distribution corresponds somewhat more closely to the parties’ vote shares than originally predicted, but the Liberals still gained a significantly disproportional advantage from how the votes were distributed. As in Manitoba, the results reflected a strong regional divide, with the Conservatives sweeping several rural regions and the Liberals taking a disproportionate number of the seats in the Greater Toronto Area. Time For Elections To Make Sense? When I explained these various provincial election results to my children, they were aghast. “How can they let this happen?” they asked me. An excellent question. I’m doing all I can to stop these outrageous outcomes, and I invite all of you to join Fair Voting BC in working for an end to elections that don’t make sense.